The department is staffed by a fully qualified Computer Science teacher, Mr J Raisin and by Mr N McCoach. The department has three fully networked rooms and further access to a suite of networked computers in the school's library. 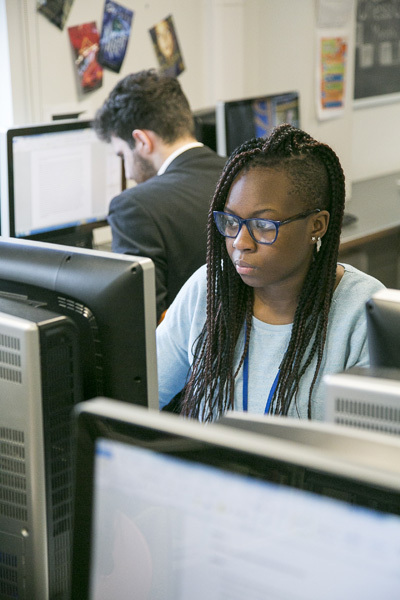 The Computer Science curriculum is designed to meet the UK National Curriculum aims. The aim of the curriculum is to develop confident digital citizens who are ready to meet the challenges of the digital world. Students should feel safe when using technology and the web by learning what their rights and responsibilities are, as well as how legislation can protect them while online but also respecting others whilst in the online realm. Our students need to understand how to utilise the power of the cloud and cloud based services which can be a powerful collaborative tool - for this we use Google Classrooms. This course has been updated to reflect new and emerging technologies. This course is for students who wish to go on to higher education courses or employment where a deeper knowledge and understanding of computing would be beneficial. The focus has shifted towards computational thinking within the field of Computer Science, with its emphasis on abstract thinking and algorithmic problem-solving, it is a good foundation for understanding the technological challenges currently facing the industry. Computer Science is also a practical subject where students can apply the computational thinking principles learned in the classroom to real-world systems. E-records of student progress are updated regularly, and often at the end of each lesson. At present the department is developing systems which will allow for online access to these records by both the student and the parent, to engender further motivation and progress. Robotics Club - for committed Computer Science students. Programmer or Software Developer - typically will be responsible for design, testing, build and maintenance of software systems. Network Engineer - typically is responsible for installing, supporting and maintaining hardware & software for a company. Ensuring communication networks are kept up running 24/7. Web Developer - typically responsible design, layout and coding of the website.